An Energy Master Plan for London? As part of this work, a Call for Evidence has been issued setting out five ‘core questions’ (see link for details), open to all to respond to, with a deadline for submissions of 24 January 2014. “To address these issues, and address the implications of climate change, a range of recommendations are being proposed. All need further explorations in terms of feasibility and value for money, but provide a starting point for determining how London may need to respond to its infrastructure needs. The list of draft proposals to date is attached at Annex A; they include: Develop an Energy Master Plan for London, based on favoured approach of either continued nationally led centralised provision, or a decentralised model based on local energy production from a range of low and zero carbon energy sources. 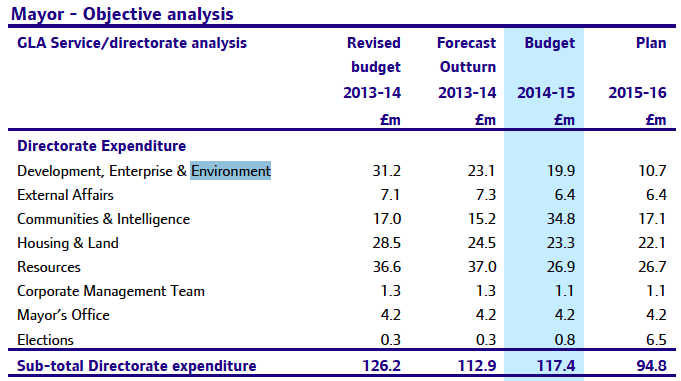 (Favoured approach to be set out in the Infrastructure Investment Plan for London). Potential concerns over future stresses to London’s electricity system led to the Mayor writing recently to Ed Davey, Secretary of State for Energy, and the formation of the Mayor’s High Level Electricity Working Group. A strategic outlook on London’s future energy needs (both power and heat) is an absolute requirement of any future London infrastructure plan: much of London’s electricity distribution assets are in need of replacement, London’s population is set to grow significantly to 2020 and beyond, and the the Mayor’s own target for London to source 25% of its energy needs from decentralised energy will require a significant shift to the introduction of low carbon, localised generation capacity being introduced onto London’s electricity network. The Long Term Infrastructure Investment Plan for London will be produced in two stages – an interim report (inviting comment) in February 2014 and a final report in Summer 2014. December 2013: National Grid news release announcing that “Work to dismantle the gas holders at National Grid’s site in Battersea got under way recently and the local community are being invited to find out how this and future work will play a part in the exciting redevelopment plans for the area. Some fascinating historical background to the site can be found at www.BatterseaGasholders.com. 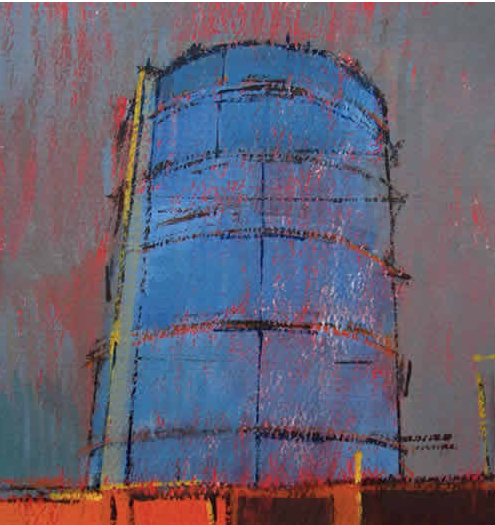 And here’s a great drawing of one of the Battersea gasometers – part of a series of drawings of London gasometers – by artist Daniel Preece. December 2013: A run through some of the exciting decentralised energy developments currently being taken forward in London – as detailed by Energy for London – ahead of the major national Heat13 conference, which took place in London last week. December 2013: Presentations and an audio record of the the recent Future of London workshop on the ECO and RE:NEW have recently been posted online. 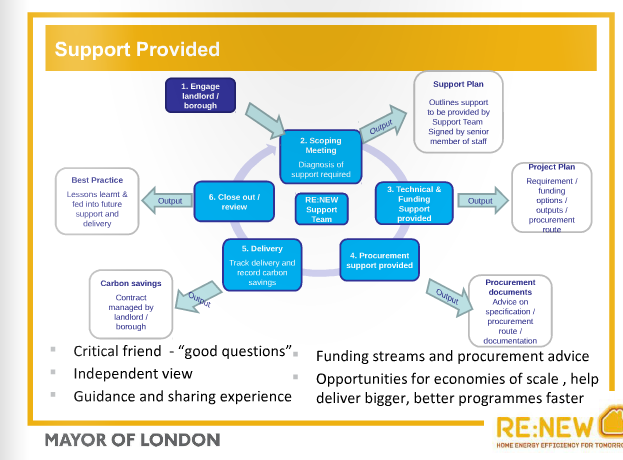 This was a really helpful event include contributions from the GLA’s interim RE:NEW Support Team on the range of areas they provide help to London local authorities with – see slide below (and for further details on their activities see an earlier post here), Havering Borough Council, EDF Energy, and Agility ECO – an interesting new consultancy working with local authorities on the ECO, made up of previous supplier obligation experts at British Gas. The delays have led to the project being graded an ‘amber’ rating under the paper’s ‘traffic light’ performance system. Capita Symonds were appointed to operate an interim RE:NEW Support Team – and began work in June of this year, with the GLA’s £150k funding covering programme activities until the end of December 2013. The RE:NEW paper proposes extending this funding by up to £200k for the Support Team to continue activities until the end of March 2014. 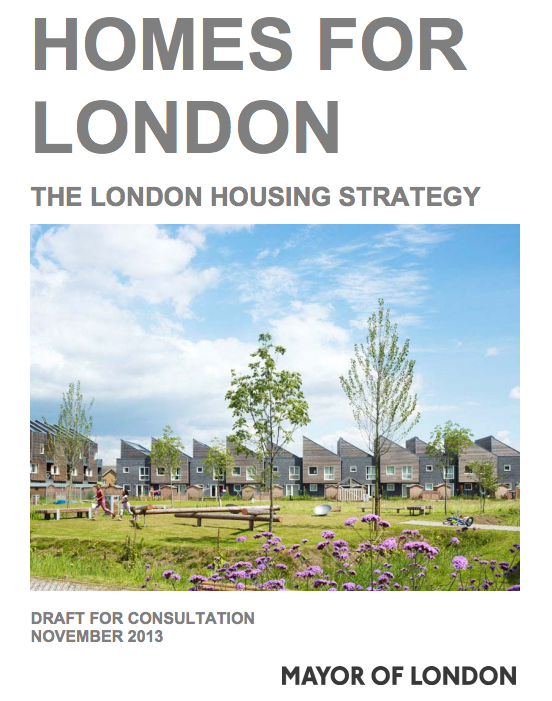 The Housing paper also relates that the GLA is hoping to secure up to £3.85 million from the European Investment Bank’s (EIB) ELENA programme “to procure the full RE:NEW Support Team for three years”. The funding process with the EIB has however taken longer than anticipated, leading to the necessity to provide funding to an interim support team. The paper highlights that a formal submission to the EIB has now been made and “funding confirmed in principle” should be sometime this month. Hopefully the EIB will be presenting the GLA with a welcome Xmas present this year – watch this space! 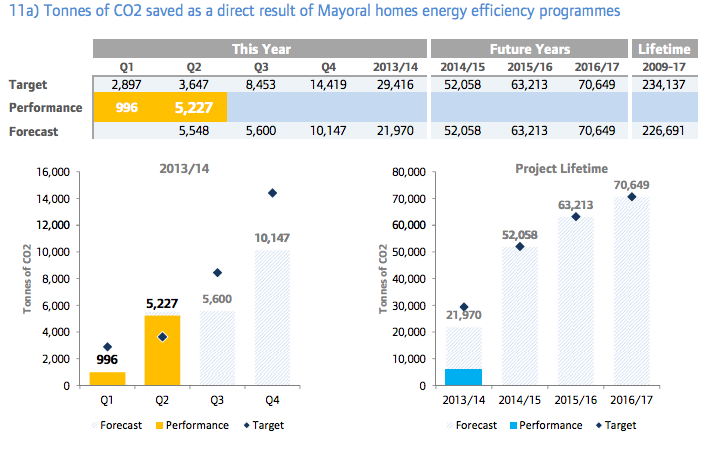 Mayor to battle with CLG over London energy and planning policies? December 2013: In response to a series of Mayoral Questions (here, here and here) the Mayor has now posted his submission to the Department for Communities and Local Government (CLG) controversial (see here, here, here and here) Housing Standards Review report and consultation. 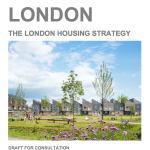 The MQ responses highlight that the Mayor has written to CLG’s Secretary of State, Eric Pickles, expressing “concerns with proposals for a National Standards set which could limit the GLA’s ability to apply planning policy on housing design and space standards as well as energy standards in new housing“. The Mayor has also asked Mr Pickles to meet in order “to discuss these proposals, and requested the opportunity to make further comments, once CLG reaches a clearer position on the proposals”. London developments are already demonstrating that the carbon compliance level could be more stretching without undermining viability. “In the absence of the [London Plan’s] approach” the Government’s proposed changes would “undermine a key tenet of DECC’s Heat Strategy for cities“. Equivalent of circa £32m investment secured through energy efficiency measures alone. Circa £20 million of investment in new CHP plant able to produce 29MW of electricity and heat. The specifications around the zero carbon homes target have been watered down to such an extent that the proposed standards in Building Regulations now fall some way short of the higher levels of the CSH. There is no guarantee that further dilution will not occur in the run-up to the implementation of zero carbon homes in 2016. DCLG must maintain CSH energy assessments as a tool for local authorities to lever in renewable energy until Building Regulations deliver genuinely zero carbon homes, which was the original target and is defined by CSH level 6. There’s no information over whether the Mayor has met with Mr Pickles as yet – and CLG have as yet not indicated when they are to finalise and publish their conclusions to the Housing Standard Review’s proposals. However it’s clear that the London Plan’s energy and climate policies have – and are continuing to – create a major shift in the development of more energy efficient buildings in London. Developers, architects and sustainability experts are delivering some of the most innovative green buildings in the world here in London as a consequence of the London Plan, and hence it would be a huge surprise if the Mayor allowed his successful planning policies to be diluted by the Government’s latest – and hugely confused – zero carbon buildings proposals.